Social network Facebook has begun rolling out shared photo albums, a new feature that lets your trusted friends contribute to your organized collections of photos on the site. When you create a new photo album on Facebook – say to hold pictures of your end-of-summer bash – you can now name up to 50 people as “contributors.” These contributors will each be able to add up to 200 pictures from the event. Ultimately, as the creator of the album, you have the power to delete or modify contributed shots you don’t like. The new feature also opens up a couple of new privacy settings for albums. You can, of course, share your pictures with the whole world, friends of contributors, or just the contributors. You can also choose whether contributors are allowed to add other contributors. 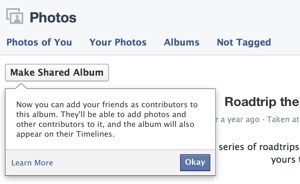 Per typical Facebook operating procedure, Shared Albums are being rolled out slowly. If you don’t have the ability to share albums yet, relax – the feature should be available to you soon.